The Toyota iQ-based Cygnet has Aston Martin's bold front grille. Aston Martin said the Cygnet -- a reworked, upscale version of the Toyota iQ minicar -- will go into production in 2011. "Our customers need a small car for urban and city use and they want the right tools for the right job, to downsize creatively without compromising intelligence, artistry and personality," Aston Martin CEO Ulrich Bez said. Marek Reichman, Aston Martin's design director, says that each Cygnet will be personalized with various materials, colors and textures. "The Cygnet is small but luxurious, an Aston Martin tailor-fit for the city," Reichman said. "Luxury is not constrained by scale." 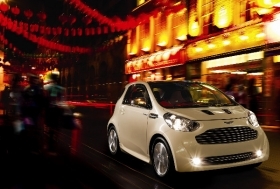 The Cygnet will be produced at Aston Martin's Gaydon headquarters in Warwickshire, England. It will be the eighth major production Aston Martin car produced at the factory since 2004. Aston Martin plans to sell about 4,000 Cygnets a year, at a price of about 30,000 euros. Further details on pricing and specification will be announced later this year.